And if you’re adventurous, you can try a number of different variations of nut and seed combinations and make this healthy snack uniquely your own. Just keep the amounts of dry ingredients thesame and you should be fine. Wrap them in squares of wax paper as a take along treat and keep them in an airtight container for at home snacking. Or for an traditional experience, enjoy a few pieces with a cup of Greek coffee in the afternoon. Delicious and nutritious! Store bought pasteli will often add sugar which makes for a harder candy. 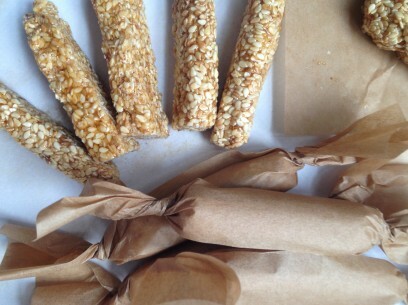 I think the chewy goodness is part of pasteli so I’m partial to the homemade, no sugar added variety. Pasteli is not a Greek word. It’s Spanish or Italian of sorts meaning a confection of some kind. Because Greeks do not have many candies or confections, this name stuck and these sesame treats are known by Greeks the world over as pasteli. Though I’m a fan of using parchment paper here, this recipe is traditionally cooled on a very lightly oiled baking sheet. It did take a few tries to achieve the right consistency and flavor for the honey-free version using agave but I believe the recipe below really does the job well. Toast seeds in dry pan over medium heat until they turn a soft golden brown. Be careful not to allow seeds to a dark brown. Remove seeds from heat and set aside. 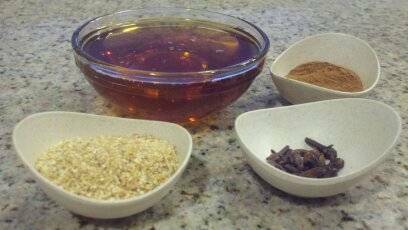 In a 3 quart, heavy bottomed pot, slowly heat honey and lemon peel (or agave nectar, lemon peel and spices). Mix well and bring to a boil. Remove from heat. IMPORTANT: Make sure to remove all cloves from the liquid before adding your seeds. I like to wrap the cloves in a piece of cheese cloth tied with string to avoid any dental accidents! Stir in sesame seeds 1 cup at a time being sure to get all seeds covered in sweet syrup. Once seeds have been completely incorporated, spread mixture out in a single even layer of about 1/4 inch thick. Leave uncovered to set for approx 20 minutes (1 hour for agave version). Cut into small pieces and keep in airtight container with parchment or wax paper between layers of candy. Try cutting your pasteli into rectangles as I have here which is the traditional shape or get creative and make up your own! Do you use the cloves with the honey version? If you’re using the sugar, when do you add it?